Finally, it was time for our fast pass and Lexi was pretty psyched at that point to ride an actual roller coaster. I have uploaded a video of the ride. You can clearly see how excited she is at first, then as it start going down and most importantly shaking, she gets pretty terrified. Let’s pause here for a second and talk about why all the small rollercoasters so bumpy. Like seriously, it’s unpleasant to ride for adults. For kids, it must be terrifying the first time. So as we were being thrown back and forth by the bumpiness of the ride (and we requested the front row because they are less bumpy than the tail), Lexi was sort of whimpering and I was repeating “I got you, sweetie! I am holding you!”. Then as it went on its last circle and hill, it stopped being so shaky and you can see in the video that she actually started smiling. A very reserved shy smile, but a smile nonetheless. The whole time I was trying to keep her as secure as possible, so that she wasn’t so jostled by the ride. A very interesting thing I noticed: I remember riding this rollercoaster with a 5 year old Gabby (Our friends daughter). 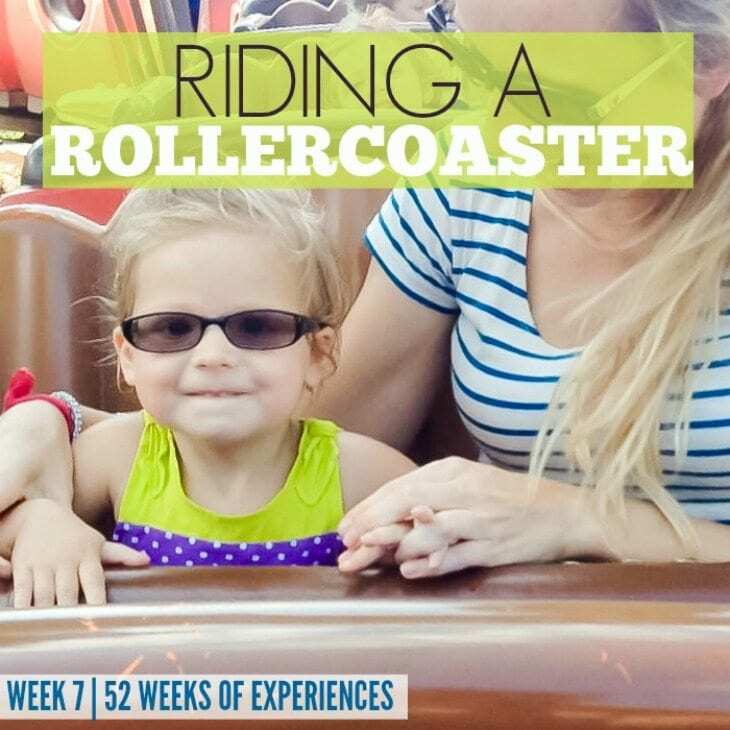 It was her first rollercoaster and she was equally terrified of going on it, because first of all, she was old enough to comprehend what was going to happen and secondly, first times are always scary. So as I was sitting in front of my friend and her daughter I was able to take pictures throughout the whole ride and it’s absolutely amazing to see the EXACT same expressions on her face as Lexi had. Terrified look and then a tentative smile with tucked in lips. I love the video! Thank you for sharing! I can’t wait until my little one is old enough to comprehend what’s going on at Disney. It looks like Lexi had fun despite being a little nervous. Ah she’s so sweet! And seriously, with all the engineers and technical type people who must work on designing and building coasters, they can’t make them just a LITTLE bit smoother?? I love these experiences. This week we made a paint mess! My goodness she is cute! Love how she clings to her daddy. Swoon! She is the exact age as my daughter, and we are seeing the same aversion to the camera. Do you have any ideas on what helps? We have just put it away, only bringing it out for special occasions, and not ‘prompting’ her, more like just taping what’s going on, not “focusing just on her.” (Did that make sense? Lol). Maybe your husband can film some things “hiding” in the other room, peeking out to get a candid conversation between you and Lexi. Did she get to go on her boat ride? I have not found much that helps the camera issue. Even if she is not paying attention to the camera and I am sneaky about pulling it out, she somehow won’t repeat what she was doing/saying. It’s quite frustrating because there are so many cute things she says and does that I would love to have a video of for when she is older, but I have not been able to get much. I do have some videos that I really treasure, but there could be a lot more. Husband hiding… haha I wish he cared about photos or videos enough to do that. Besides, candid usually means spontaneous so you can’t really “stage” it like that 🙂 I need to do something for the after nap babble- she comes up with the cutest weirdest things when she wakes up- it’s adorable!